Some myths have portrayed Abasdarhun as a demon. In fact a rock band once took this angelic name, perhaps thinking that it represented one of the Spirits of the Goetia. Abasdarhun’s title, however, is Supreme Ruling Angel of the Fifth Hour of the Night. While Abasdarhun is never mentioned in Hebrew scripture, his name does appear in other sacred and ancient mythological books. When the names of the angels are listed, this one always appears high on the list. There is a legend that angels are assigned to guide every phase of human activity. 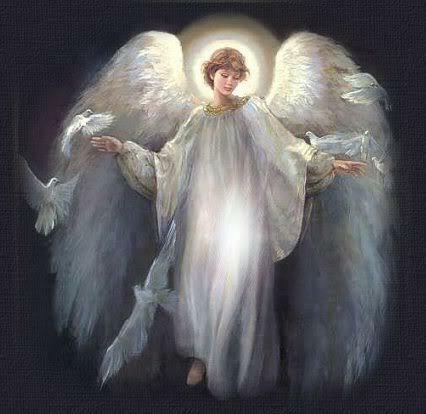 We are each surrounded by not only a guardian angel, but a host of other angels of lesser rank that stand by throughout our lives, anxious to respond to every prayer for their assistance. Their influence is so carefully proportioned, angels are said to be assigned to each hour of the day and night. They also are said to be watching over each month, each season and each year. It is believed that angels of the hours can be called upon for assistance during their respective times of service. This, then, is the significance of Abasdarhun’s title as angel of the fifth hour of the night. It suggests that the time he is active is probably between four and five o’clock, if midnight marks the official beginning of the night. If the night begins when the sun sets, we might have a problem determining just which will be the fifth hour since it changes with the seasons. The advent of Daylight Savings Time must also add confustion to the time this angel reigns. No matter how his time is measured, Abasdarhun never rests because the world is constantly turning, the night hours are constantly moving from zone to zone, and a certain portion of the human population is living in the fifth hour of the night at all times. This theory also suggests that the angelic realm has adapted to the human-created system of measuring time including the calendar year. From the spiritual realm beyond the veil, where time appears to be non-existent, the assignment of angels to watch over specific hours of the day is somewhat baffling. Yet this seems to be the Angel Abasdarhun’s role. In fact, he is one of 24 named benevolent spirits, each assigned to constantly watch the clocks on Earth. So important is his position that Abasdarhun rules over five lesser angels identified as Charby, Chrymos, Hameriel, Patrozin and Phatiel. Why would the world need so much angelic help during what poets have long described as the darkest hour before the dawn? It is perhaps the quietest time of every day when most humans and creatures are at rest. We have to wonder why the angels are busy cloaking the secrets of the universe. Humanity has been busy for centuries building telescopes, listening devices, rocket ships and every other machine that can be imagined to unlock those secrets. While we haven’t “uncloaked” them all, what we have learned is that no matter what exists in the amazing universe we live in, there isn’t much anybody can do to change one iota of the Creator’s magnificent workmanship. The best we can do is admire it and try to understand how it all works.